Working with and documenting waterlogged wooden objects pose a special challenge to archaeologists. Modern structured light 3D scanners support the work of archaeologists and help to analyse and evaluate artefacts in a greater detail. This case study of excellence showcases how waterlogged wooden objects excavated from historic mines in the Ore Mountain region are documented. 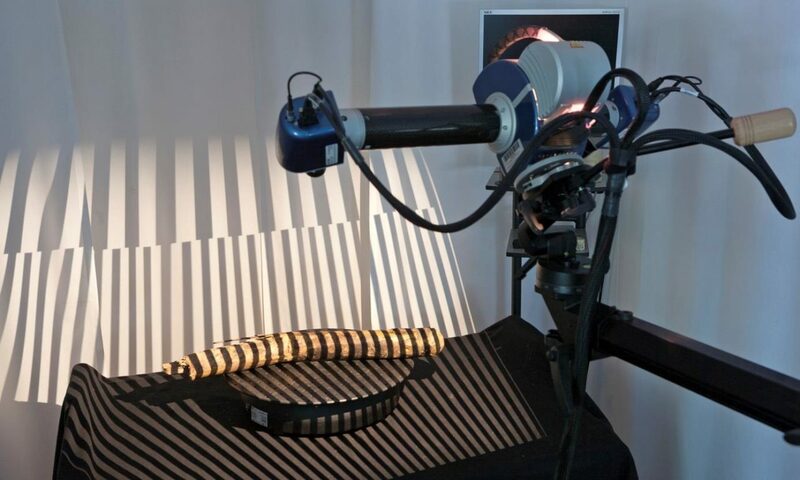 The Archaeological Heritage Office of Saxony, lead partner in the binational German-Czech research project ArchaeoMontan, has developed a broadly-adaptable approach that foresees 3D scanning each wooden find twice: before and after the freeze-drying treatment. 3D models created from the two scanning processes allow archaeologists to analyse and evaluate the results of the conservation procedure. Knowledge gained from the interdisciplinary project will be beneficial when it comes to selecting the best conservation method for wood artefacts. The Archaeological Heritage Office of Saxony/Landesamt für Archäologie Sachsen (LfA) is one of the leading experts in the field of conservation and documentation of organic waterlogged artefacts. 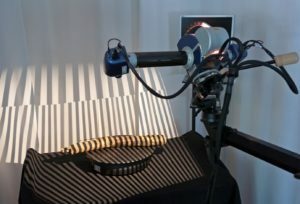 In the frame of an international EU-funded research project – ArchaeoMontan1 – that was initiated after the discovery of medieval silver mines in the Ore Mountain region in 2008, archaeologists and conservators from the Archaeological Heritage Office of Saxony acquired new skills in handling, 3D scanning, conserving, and evaluating challenging wooden finds from mining sites. Wood was used extensively in historic mining. Tunnels and pits were secured with massive wooden structures; but also smaller wooden objects like handles from tools can still be found in the abandoned mines. Organic materials pose a special challenge to archaeologists: on the one hand these materials can provide a range of important information and their examination can shed light on many aspects of life in the past, on the other hand, organic finds that remained in a constant climate over centuries are often very sensitive to changes in environmental conditions.2 The binational research team from Germany and the Czech Republic had to establish a swift and effective workflow that benefitted the preservation of the wooden artefacts. This paper focuses on the 3D scanning procedure of the wooden objects before and after vacuum conservation as well as the evaluation and interpretation of measurement data. At present the Archaeological Heritage Office of Saxony is operating a Breuckmann smartSCAN3D-HE fringe projection system which achieves a maximum resolution of 18μm. Because of their size the wooden artefacts are scanned with measuring fields of 400mm or 800mm obtaining a resolution of 0.2–0.4mm. Tests have demonstrated that a considerably higher resolution results in making visible the annual ring texture of the wooden artefacts. Tool marks and other traces of usage or damage are then difficult to be detected.3 The Breuckmann smartSCAN3D-HE device also captures detailed colour information of the object that can later on be used when creating photorealistic models and animations. In the course of ArchaeoMontan, and its follow-up project which started in 2015, far more than 1000 wooden objects were excavated from the medieval mines in North-Bohemia andthe Eastern Ore Mountain region. An automated rotary table is used for scanning smaller objects with a length up to one meter. For large-scale objects either a step-by-step scanning method or a mobile handheld 3D scanner is used. Afterwards, finds are immediately transferred to the hands of the conservators. Years of experience have proven that vacuum freeze-drying waterlogged wood is so far the most satisfactory method of conservation. It must be noted that all conservation methods lead to dimensional change and deformation of the wood. Following the first 3D documentation phase, the pieces of timber are soaked in several baths of tap and deionized/filtered water. In a next step the objects are impregnated with polyethylene glycol (PEG 2000) and a solution of deionized water. Vacuum freeze-drying the wooden artefacts at a temperature of approx. -40°C to -50°C is the final step in the preservation procedure. The entire process of preparing, soaking, impregnating, freeze-drying and cleaning the artefacts can take up to several years.4 During this time archaeologist cannot examine or work with the original objects. High-resolution 3D models and a careful documentation of the find-spots (if feasible, mine shafts are also recorded by the help of different 3D scanning methods) make it possible that object and location can be further analysed and interpreted also during the time of conservation. and in educational contexts. 5 In order to monitor the results of the vacuum freeze-drying process and to quantify the dimensional change of the wooden objects, artefacts are 3D scanned one more time. Based on the data captured during the before/after conservation procedure the change in size, volume, shape, and structure of the object can be precisely determined and visualized. 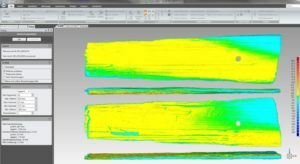 Geomagic Studio, a reverse engineering and scanning software, allows archaeologists and surveyors to make a detailed deviation analysis between the models of the wooden objects. A color-coded texture on the model visualises the degree of deformation. With this method, scientists from the Archaeological Heritage Office of Saxony can analyse and evaluate the results of the conservation process of challenging organic artefacts in a much great detail. Currently, their databases contain information sets from more than 1000 waterlogged wood finds. The deviation analyses will be completed in the next years depending on the progress of the conservation process. Additionally, this range of data allows archaeologists to establish relations between state of conservation and type of wood/ state of preservation after excavation/ degree of wear, etc. Experiences and knowledge gained in the binational research project ArchaeoMontan are going to be of great benefit for future excavation and documentation projects. The evaluation of the datasets gained from the 3D scanning processes can help not only to reveal new details about mining in medieval Central Europe and the Ore Mountain region but also guide archaeologists when choosing the best conservation strategy for sensitive wooden artefacts. Using 3D scanners for the recording of challenging organic objects has proven to be the best approach feasible for a quick, non-destructive, thorough, sustainable, and multi-facetted documentation of archaeological finds. In order to optimize the scanning process it will be necessary to introduce mass-digitization techniques to the work flow. A large pool of data collected via mass-digitization will make it possible to further unlock the potential of 3D models and support research. Schmidt-Reimann, P.; Reuter Th. (2015): Conservation and 3D-documentation of waterlogged wood from medieval mining. In: K. Piotrowska; P. Konieczny: Condition.2015 – Conservation and digitalization, conference proceedings (pp.125-130), Gdansk. Reuter, Th. ; Innerhofer, F. (2016): Mehr als bunte Bildchen – Moderne 3D-Scanner in der Funddokumentation im Landesamt für Archäologie Sachsen. In: Blickpunkt Archäologie (pp.105-111), München. Karsten, A. et al. (2012): Waterlogged Organic Artefacts. Guidelines on their Recovery, Analysis and Conservation, English Heritage, Swindon.